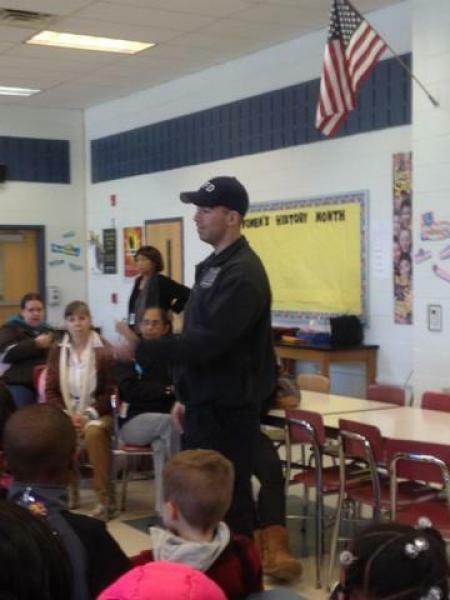 On March 4th, 2014 at approximately 2:30pm members of the East Franklin Fire Department were requested to Macafee Road School (53 Macafee Road) in order to speak to an Aftercare School Program regarding Fire Prevention. FF/EMT Daughton, FF Cezar, FF Espinoza and FF Lebrew visited the school with Engine 27-8. During this time, we went over preventative measures to take regarding equipping your homes with working smoke detectors, having fire extinguishers readily available, setting up an escape plan in the event of an emergency and how/when to dial 9-1-1. After a brief speech with the group (Approx. 50 Students), FF Lebrew and FF/EMT Daughton demonstrated what a fully geared up firefighter would look like, should we respond to the children’s residence. Following this, we allowed them to view E-278 and spoke with them about all the equipment we use, during natural and man-made emergencies. Pictures are posted below, enjoy! FF Lebrew getting ready to gear up! FF Lebrew crawling around, so the kids can see how we work!